Amazon.com description: Product Description: By Gisele Umbhauer . . . . . . . . . . . . . . . . . . . . . . . . . . . . . . . . . . . . . . . . . . . . . . . . . . . 1 Part I: Interaction and Macro-Struture: an Overview Economies with Interacting Agents By Alan P. Kinnan (GREQUAM) . . . . . . . . . . . . . . . . . . . . . . . . . . . . . . . . . . . . 17 Spatial Interactions in Dynamic Decentralised Economies: a Review By Giorgio Fagiolo (EUI) . . . . . . . . . . . . . . . . . . . . . . . . . . . . . . . . . . . . . . . . . . . . . . 53 Network, Interactions between Economic Agents and Irreversibilities: the Case of the Choice among Competing Technologies By Patrick Cohendet (BETA) . . . . . . . . . . . . . . . . . . . . . . . . . . . . . . . . . . . . . . . . . 93 Rationality and Heterogeneity in Stochastic Aggregation Models By Jean-Michel Dalle (IEPE) . . . . . . . . . . . . . . . . . . . . . . . . . . . . . . . . . . . . . . . . 123 Part II: Local Interaction, Learning and Diversity Networks Competition under Local Interaction and Behavioral Learning By Nicolas Jonard (BETA), Patrick Llerena (BETA) and Babak Mehm- pazir (BETA) . . . . . . . . . . . . . . . . . . . . . . . . . . . . . . . . . . . . . . . . . . . . . . . . . . . . . . . . 149 Can Neighborhood Protect Diversity By Gisele Umbhauer (BETA) . . . . . . . . . . . . . . . . . . . . . . . . . . . . . . . . . . . . . . . . 167 Interaction of Local Interactions: Localized Learning and Network Exter nalities By Nicolas Jonard (BETA) and Murat ytldlZoglu(BETA) . . . . . . . . . . . . 189 viii List of Contribution Evolution of Cooperation with Local Interactions and Imitation By Vanessa Oltra (BETA) and Eric Schenk (BETA) . . . . . . . . . . . . . . . . . . 205 On the Frontier: Structural Effects in a Diffusion Model based on Influence Matrixes By Alexandre Steyer (REC) and Jean-Benoit Zimmermann (GREQUAM) . . . . . . . . . . . . . . . . . . . . . . . . . . . . . . . . . . . . . . . . . . . . . . . . . . . . . . . . . . . . . . . . . . . . . . 223 Part III: Behaviors, Externalities and the Emergence of Networks Networks, Specialization and Trust By Ehud Zuscovitch (BETA) . 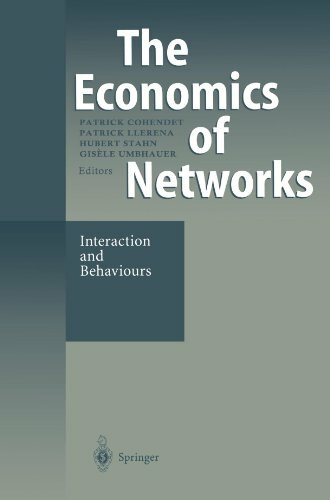 . . . . . . . . . . . . . . . . . . . . . . . . . . . . . . . . . . . . . . . . 243 Network Externalities, Cost FUnctions and Standardization By Hubert Stahn (BETA) . . . . . . . . . . . . . . . . . . . . . . . . . . . . . . . . . . . . . . . . . . . . 265 The Emergence of Network Organizations in Processes of Technological Choice: a Viability Approach By Jean-Pierre Aubin (IIASA) and Dominique Foray (IRIS-TS) . . . . . . 283 Are more Informed Agents able to shatter Information Cascades in the Lab? By Marc Willinger (BETA) and Anthony Ziegelmeyer (BETA) . . . . . . .
About: By Gisele Umbhauer .